The following are 22 separate tracks which display some of my versatility and musical skill. The tracks are arranged to highlight the contrast in styles. (All voice and accompaniment by me). The first 3 tracks are appropriate for the High Holy Days. Hazzan Israel Alter’s setting of Hineni, a traditional setting for the start of the Musaf service. Sim Shalom for HHD is a setting of the final Amidah blessing written by me and used, without instrumentation for the last few years. Kol Nidre is self-explanatory. Tracks 4 through 10 are appropriate for Shabbat. Tov l’hodot, the setting of Psalm 92 by Ken Chasen can be used with or without instrumentation. It is particularly welcome when the congregation prefers some English language songs. Yedid Nefesh, composed by me, attempts to bring out the urgency in the piyyut which is often ignored. Ahavat Olam, on the other hand, is my setting of the prayer to the Devekus tune, which is peaceful and loving.The Shacharit Amidah (the 4th blessing) has four paragraphs: the first is sung to the tune of Cuando el Rey Nimrod (Sephardic, in the proper mode), the second, V’Shamru, is sung to the Carlebach tune, the third, V’lo N’tato, is another composition by me with a repetitive chorus, and the fourth is a common setting for Kad’sheinu. 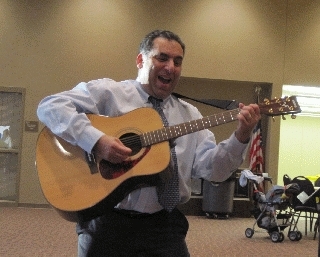 Bim Bam, by Nahum Frankel, is part of the Tot Shabbat that I lead, while track 8, “Shabbat is a Holy Day” is part of the children’s CD collection “Songs of Rose” by Rose Levine. Mah Tovu, useful for the beginning of any service, is the Charles Davidson setting. Tracks 11 through 14 are weekday melodies. Track 11, the Debbie Friedman “Aleph Bet,” is a standard for the preschool. Track 12 is the first aliyah of the Vayakhel Torah reading (a bridge from Shabbat to weekdays). Track 13 is the weekday Amidah Avot and Kedushah. Track 14 is my setting of Hodu (in Hallel) to a gospel tune by Livingston Taylor. Erev shel Shoshanim (Dor and Hadar) is one of the many beautiful wedding songs. The Dodi Li, from Shir HaShirim, is one of my simple compositions. Give Yourself to Love is a secular piece by Kate Wolf, also appropriate for weddings. Gracias a la Vida is a beautiful Chilean song (Parra). Songs of loss can take on many aspects. Bring Him Home, from Les Mis, and Hamilchama Haachrona evoke the hope for the next generation. The Eil Malei is a modified setting by Katchko. Finally, a medley of various songs that might be more easily distributed.